This Thing Called Swing is now sold out. I would like to thank all of you who bought the book. It was self-published with only DIY distribution, and I hadn't expected to sell them all. Review by Wolfram Knauer, Jazz-Institut Darmstadt. Jazz Podium (Germany), June 1998. Translated from German by Franziska Guenther. There are few serious books on dance as an important part of the development of jazz music. "Jazz Dance. The Story of American Vernacular Dance", published by Marshall and Jean Stearns in 1968, remains the standard literature, mainly due to its thorough analysis of dance. Chris Batchelor's book "This Thing Called Swing", however, looks at the relationship between music and dance in the thirties in a way more accessible to the layperson. Although published by himself, the book has a pleasing layout with many good reproductions of photographs, informative diagrams, and music listings. It does not in the least make a home-made impression. Batchelor starts off with a concise history of jazz, focusing on the sociological rather than the musical aspects of the development of jazz, such as the ways of presentation and the music's effect on and the reaction by the audience. Batchelor offers keywords and gives short explanations which quite often lack a sufficiently scientific background. Nevertheless, he paints a colourful and realistic picture of the New York neighbourhood of Harlem in a four-page chapter. This is followed by a description of the individual clubs, a city map showing their locations, and an explanation of their history and their musical or show programmes. In the process, Batchelor highlights the connection between the location, the music and the social or performance dancing. The subject of part II is "The Jazz Age: 1920 - 1929". Batchelor begins with a timeline, chronologically representing events important to jazz in the 'scenes' of New York, Chicago, and Kansas City. The following short chapters introduce (in this order) the early record industry, Fletcher Henderson, Louis Armstrong, Paul Whiteman, Guy Lombardo, Duke Ellington, McKinney's Cotton Pickers, Benny Moten, the rhythmic phenomenon of swing, the dance marathons, and the lindy hop. The biographical notes are kept short and focus mainly on the importance of the bands and musicians to dance. The music listings are chosen in the same vein, concentrating, e.g., on pieces which Ellington played specifically for a dancing audience. Part III is dedicated to "The Great Depression: 1930 - 1935". Batchelor discusses the new role of the big bands' arrangers, introduces different black and white bands of the time and gives ample space to black tap dancing, including film listings. Batchelor shows the career path of a professional lindy hop dancer, using the example of Frankie Manning; writes about the development of the Savoy Ballroom in the thirties and about the amateur dance contests. Part IV discusses, among other things, the importance of radio shows for the swing era, the war between the copyright owners ASCAP and BMI, the phenomenon of music boxes, the progress of recording technology and record production, the night life in downtown New York, dance companies such as Whitey's Lindy Hoppers, the jitterbug, and, of course, several new variations of the lindy hop. Part V, "From War to Peace: 1942 - 1947", concentrates on the influence of the war on the music and entertainment industry. The epilogue looks at the influence that the swing era and lindy hop had on the time after 1950, rock'n'roll, and the lindy hop revival of the eighties. The appendix includes tempo charts, a list of important recordings from the swing era which are ordered by "beats per minute", ranging from the extremely fast "Toby" by the Benny Moten Orchestra (312 bpm) to the slow "Bear Mash Blues" by Erskine Hawkins. 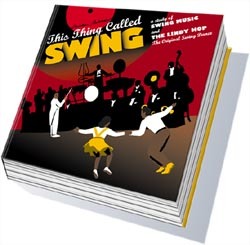 All things considered, "This Thing Called Swing" is a book very rich in dates and facts that offers a wealth of information which cannot be found in most of the existing jazz literature. It provides insight especially into the sociological phenomena of a music which, after all, was the pop music of the thirties. The easy-to-understand order of the chapters, the accessible layout, the informative graphs and the very carefully compiled index will help readers to use this highly recommendable book for quick reference. The first edition, published by the author, has been kept to 1000 books and can be ordered directly from Christian Batchelor. This Thing Called Swing is a history of jazz looked at from the point of view of the dancers, the bands as bands for dancing, said reviewers Digby Fairweather and Dave Gelly on the Jazz Notes Programme broadcast on BBC Radio 3, 4 May. 'An extraordinary angle'. The basis of the book is on jazz as the focus for social dancing and it starts with the very beginning and goes up to the lindy hop revival in the 1980s. Institutions like the Savoy Ballroom, the Home of Happy Feet, loom very very large in this story, because that is where it all happened. It is a culture very much of its own, which hasnt been written about in any jazz book up until now, which makes it [This Thing Called Swing] valuable by definition. Its a beautiful, handsome book. This Thing Called Swing is reviewed in the December/January 1998 issue of Crescendo & Jazz Music, the international specialist jazz magazine. Crescendo & Jazz Music, December-January 1998, p 26. "This Thing Called Swing is the first book I've ever seen which has gone into the Big Band era from the point of view of the dancers". It's "aimed at most people who are interested in the big band era, Swing and how it came about. It is very well laid out. I'm be pleased to have it as a reference book. It's very, very good." The book was described as detailed and encyclopedic, one could see when musicians joined or left bands, where the bands played etc. It also explained why things happened. Copyright © 1997-2019 Christian Batchelor, All rights reserved.